The auto industry is rapidly transforming into another branch of technology. 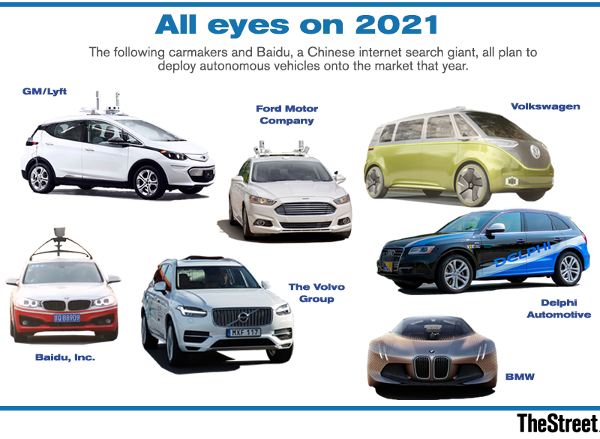 Of course, adding 4G connectivity, bluetooth and electrification made it so the auto industry is no stranger to technology, but as autonomous driving, A.I.-powered infotainment systems and other adoptions take place, more and more technology companies are making the leap into the sector. They're not obscure names, either. Alphabet (GOOGL - Get Report) (GOOG - Get Report) is considered the autonomous driving leader, while Nvidia (NVDA - Get Report) is making this futuristic concept more reality than fantasy for a number of companies. Intel (INTC - Get Report) is on the mix, while Apple (AAPL - Get Report) keeps filing patents for its "Project Titan," although we're unsure how (or if) it will ever enter the market. That's on top of the countless automakers -- General Motors (GM - Get Report) , Ford (F - Get Report) , Daimler (DDAIF and others -- that are already working in the space. But perhaps it's time to add one more powerhouse to the mix: Amazon (AMZN - Get Report) . "From global automakers and Tier I automotive suppliers to the latest mobility startup, Amazon Web Services (AWS) is helping automotive companies to build innovative connected products and services for every touchpoint of the customer journey. Our secure, agile and scalable platform can help accelerate your pace of innovation, improve your security posture and lower your IT cost structure." While Amazon is connecting seemingly everything in our homes, ranging from Alexa devices to our microwave, the car wouldn't be an unrealistic expectation. But at least for right now, Amazon is going to leave that for the pros. Instead, the tech giant is looking to provide the platform that makes all of it a reality and do so for as many companies as possible. Current automotive customers that use AWS in some form or another include BMW (BMWYY , Lyft, Uber and Audi, among others. This encompasses a massive amount of different situations, which may make AWS the perfect provider for some companies. From simpler functions like chatbots, customer targeting and marketing to more complex functions like data collection, deep learning and simulation all the way to over-the-air vehicle management and location-based services. In a way, it sort of reminds me of Nvidia, a company I believe is changing the autonomous driving game. Nvidia doesn't build the entire self-driving software and hope it can license it to other automakers. Instead, it produces the platforms that self-driving cars possible, regardless of whether it's Mercedes or BMW or Ford. Whoever wants to use Nvidia's industry-leading hardware can do so and use it to run their own applications. Amazon is not a competitor in this case, because autonomous systems need a ton of onboard power (i.e., hardware) with each vehicle. Essentially, Amazon's building a similar concept by providing developers and companies a platform for which they can build their software and then use the cloud to deploy it on a larger scale. Autonomous Driving to Drive Amazon Stock? As the cloud continues to grow, Amazon, Microsoft (MSFT - Get Report) , Alphabet and a slew of others will continue to benefit. And tech companies -- particularly those building complex autonomous vehicle (AV) systems and networks -- know the value that the cloud can provide them. So if Amazon is the market leader in this emerging industry, it could further fuel the explosive momentum that AWS is experiencing right now. In fact, AWS has been a significant driver for Amazon's top and bottom line, helping to launch the stock more than 60% so far in 2018 and almost 100% over the past 12 months. As a result, the company had recently eclipsed the $1 trillion valuation mark. Should autonomous driving companies jump aboard the AWS train, the acceleration in revenue probably won't be felt in the next quarter or two. But like Nvidia, the potential is very high as the industry continues to bubble beneath the surface. Once the technology hits its stride and begins wide-range implementation, autonomous driving revenue will be a serious revenue driver for a number of companies. If Amazon's the early leader for cloud-based AV systems and applications, it can surely keep the AWS machine well-oiled down the road and use it to help extend Amazon's monstrous run. Microsoft, Amazon, Alphabet, Apple and Nvidia are holdings in Jim Cramer's Action Alerts PLUS member club. Want to be alerted before Jim Cramer buys or sells MSFT, AMZN, GOOGL, AAPL or NVDA? Learn more now.